← The Perfect House – this dream home is a nightmare! 2 degrees of 3 made-for-TV thrillers! Back before cable and movie rentals took over the world and it took years for a movie to come to television, we were treated to loads of thrillers and scary movies made specifically for TV and modeled after the blockbusters of the time. These flicks often left an impression on our young minds, so I take on three I never forgot. And they happen to be connected by two actors! 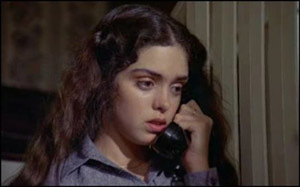 Adorable Kathleen Beller of Dynasty stars in this film that has all the makings of a slasher film—ominous notes in lockers, killer POV, prank calls, a babysitting gig—but no murders! This is a straight up tale of poor high school photography student Kathleen being stalked…until the end, when she comes face-to-face (and crotch-to-crotch) with her stalker. Little did I know, but Kathleen Beller has been married to “She Blinded Me With Science” new waver Thomas Dolby forever!!! The movie also stars a young Blythe Danner as her mother (and we see where Gwyneth Paltrow got her looks—they could be twins), Dennis Quaid as a young high schooler, and adorable Scott Colomby from the Porky’s movies as Kathleen’s boyfriend. This is a suspenseful goody and Kathleen is the perfect scared victim, so you can only be psyched when she shows up in another made-for-TV movie…. After Are You in the House Alone?, Kathleen Beller gave up photography, took sculpting in college, and landed a new stalker. Okay, the movies aren’t related, but it seriously feels like it. The movie actually starts with Kathleen being terrorized by her stalker! Everyone thinks she’s just crazy. Only her stepmother, played by Mariette Hartley, is on her side. The chase scenes are out-of-hand in this one making it a real treat for fans of the slashers of that era. And it’s not at all straightforward, eventually taking a turn so that Kathleen isn’t the only one who thinks she’s going mad. Imagine that Carrie lived, got adopted by a new family, changed her name to Sarah, and went off to college with her new sister and you’ve got The Initiation of Sarah. 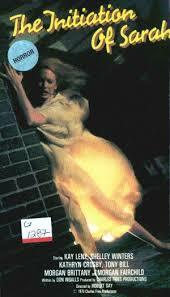 Pretty Kay Lenz is the plain adopted girl with the powers, and her sister is Morgan Brittany of Dallas. When they get to college, Morgan Fairchild accepts Sarah’s sister into her popular sorority while Sarah gets accepted into a loser sorority—and Fairchild won’t let Sarah’s sister even talk to her anymore! Sarah starts tapping into her powers to get even thanks to the provocation of her sorcery-loving house mother Shelley Winters (Roseanne’s Nana Mary!). The biggest flaw in this rip-off is that Sarah seems to be able to wield her telekinesis even when she’s nowhere near the people she’s attacking. For instance, she has no way of knowing that the two Morgans are in a shower stall in their sorority house, yet she totally locks them in it and turns the water on scalding hot from the comfort of her own sorority house. Not to mention, at one point, she seems to have the ability to turn a person into an old, hideous zombie hag. What do you want from a made-for-TV rip off of a big theatrical release? The adorable Robert Hays is the Travolta to Morgan Fairchild’s Nancy Allen, helping her play a prank that leaves Sarah and her new pretty dress all covered in what looks like steaming piles of poo. Sarah even gets her moment looking in a mirror that she then smashes with her mind. Thanks to the magic of television, actor Tony Bill stars as Sarah’s teacher’s assistant/love interest…while he played Kathleen Beller’s FATHER in Are You in the House Alone? in the same year. And finally, The Initiation of Sarah is a rip-off of Stephen King’s Carrie that also features a hedge maze in the backyard of the sorority house just like the hedge maze in the movie adaptation of Stephen King’s The Shining. However, this movie came out two years before The Shining. I guess Stanley Kubrick watched a lot of made-for-TV movies for his ideas…. 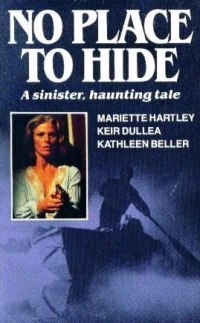 This entry was posted in Living in the 80s - forever, Movie Times & Television Schedules - Staying Entertained, The Evil of the Thriller - Everything Horror and tagged 1980s, 80s, Are You In the House Alone?, No Place to Hide, The Initiation of Sarah. Bookmark the permalink. 1 Response to 2 degrees of 3 made-for-TV thrillers!